Come see the show FRIDAY, JUNE 19 at 11pm! Congratulations, SUMMER DION, for submitting the winning entry. She will have a pair of tickets waiting for her at the door for the May 17 show! FLOAT it off, FLOAT it off! Congratulations, DEREK BRUUN, for submitting the winning entry. He will have a pair of tickets waiting for her at the door for the April 6 show! Congratulations, KATHLEEN GUIDE, for submitting the winning entry. She will have a pair of tickets waiting for her at the door for the April 6 show! BroadwayBox.com made DeBlanks the DAILY SCOOP! Thanks for the love, BroadwayBox... and thanks for all the fun "CLUE" gifs in this feature article! Congratulations, PETER GAGNON, for submitting the winning entry. He will have a pair of tickets waiting for him at the door for the Feb. 18 show! CULTURALIST - Top 10 DeBlanks Cast Reactions! Here's a fun collection of photos from past performances! THE JERSEY JOURNAL announces our upcoming performances! Thanks to Summer Dawn Hortillosa and The Jersey Journal for helping to spread the word! Congratulations, ARIEL WALDMAN, for submitting the winning entry. She will have a pair of tickets waiting for her at the door for the November 7th show! "Escape (The GIN AND TONIC Song)"
Congratulations, CAROL WEIL, for submitting the winning entry. Check out the sweet announcement they posted about us. DeBlanks is Back — One Night Only! Villain: DeBlanks is back to make you (VERB)_____ your (BODY PART)____ off! 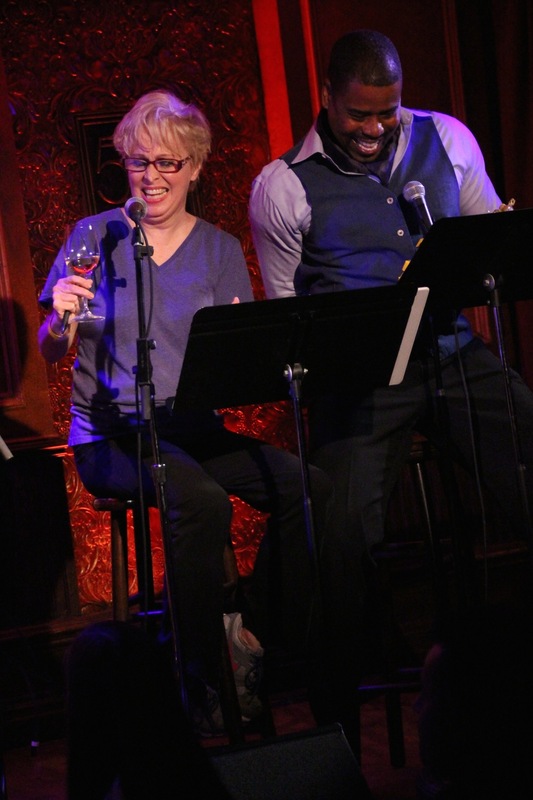 On Friday, November 7 at 11:30pm, we're going to wreck 54 Below… with hijinks & shenanigans. Seriously, though, laughs are guaranteed, with a cast like this: Klea Blackhurst, Nick Cearley, Bernard Dotson, Cady Huffman, Lesli Margherita and Christopher Sieber, with Heather Shisler. Congratulations, BRITTANY GREUNKE, for submitting the winning entry. She will have a pair of tickets waiting for her at the door for the August 7th show! Congratulations, JUDITH MOSS, for submitting the winning entry. She will have a pair of tickets waiting for her at the door for the July 31st show! 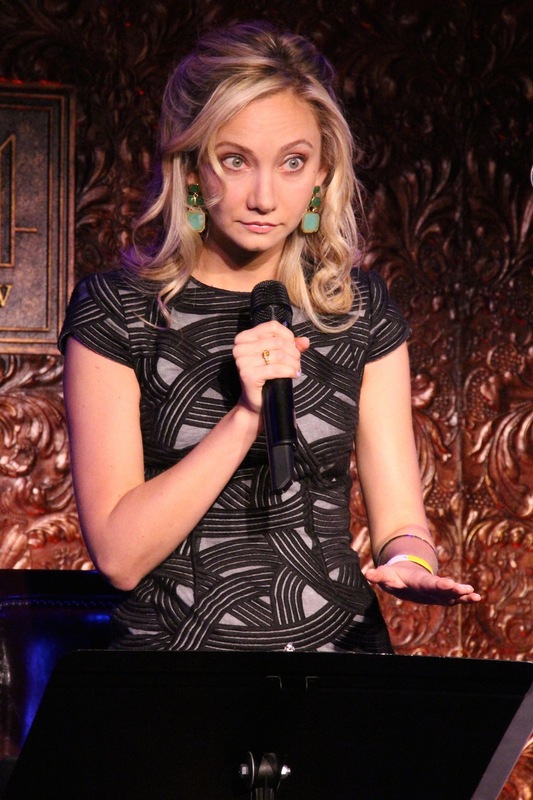 Last night "Villain: DeBlanks" made its New York debut at 54 Below, and the photos say it all. Beginning the night collecting words from the audience, and then reading the resulting script – unedited and unrehearsed – the uproarious first night cast included Bobby Cronin, Bernard Dotson, Barrett Foa, Lesli Margherita, Nancy Opel, Ryann Redmond, and Heather Shisler. Congratulations, BRENDAN APPLEGATE, for submitting the winning entry. He will have a pair of tickets waiting for him at the door for the July 24th show! And you aint no HOCKEY STICK of mine. 54 BELOW, Broadway's Supper Club, presents three benefit performances of "Villain: DeBlanks," a fill-in-the-blanks whodunnit, at 11:30 pm on July 24, July 31, and August 7. The performances will benefitBroadway Cares/Equity Fights AIDS. Written by Billy Mitchell, "Villain: DeBlanks" is a late-night fundraiser where the cast needs the audience as much as the audience loves the cast. Among those scheduled to appear are 2014 Tony Award winner Lena Hall (Hedwig and the Angry Inch), stage and TV star Barrett Foa (Buyer & Cellar, CBS' NCIS: Los Angeles),American Idol finalist Justin Guarini (Wicked), Olivier Award-winner Lesli Margherita (Matilda the Musical), Broadway legend Nancy Opel (Rodgers+Hammerstein's Cinderella), drag legend Hedda Lettuce, Tony Award winning producer and actor Hugh Hysell (My Big Gay Italian Wedding/Funeral), Time Out New York's man-about-town Adam Feldman, Sirius XM host Julie James and an array of other hysterical entertainers. "Good news: Phillip DeBlanks is dead! He was a villain, a scoundrel and a lousy dancer. Or was he? Is it possible Phillip DeBlanks was framed by one of his circle of friends?" The audience provides nouns, verbs, adjectives, desserts and body parts, and the actors provide the laughs - uncensored and unrehearsed - as the cast enacts the story using the words put in their mouths. It's "Clue" meets adult "Mad Libs," performed by some of the funniest people in New York. Like a ride to summer camp in the back of a station wagon, each hilarious performance will be ridiculously one-of-a-kind, and, best of all, the proceeds benefit Broadway Cares/Equity Fights AIDS. Presented in association with La Vie Productions/R.Erin Craig. Villain: DeBlanks plays 54 Below (254 West 54th Street) on July 24, July 31 and August 7 at 11:30 pm. There is a $10-$30 cover charge and $20 food and beverage minimum. Tickets and information are available athttp://54below.com/artist/villain-deblanks. Tickets on the day of performance after 4 pm are only available by calling (646) 476-3551. For more information, please visit Broadway Cares online at broadwaycares.org, on Facebook atfacebook.com/BCEFA, on Twitter at twitter.com/BCEFA, on YouTube at youtube.com/BCEFAtv and on Instagram at instagram.com/BCEFA. 54 BELOW, Broadway's Supper Club, is the new performance venue in the grand tradition of New York City nightlife. A few blocks from the heart of Times Square and just below the legendary Studio 54, 54 BELOW is a classically designed state-of-the art nightclub in the theatre district that hosts audiences with warmth and style. The venue provides a food and beverage menu from early evening through the wee hours of the morning that is worthy of the world-class entertainment on the stage. In their description of 54 BELOW, The New York Times writes "the club has the intimacy of a large living room with unimpeded views and impeccable sound; there is not a bad seat. Its sultry after-hours ambience is enhanced by brocade-patterned wall panels planted with orange-shaded lanterns. And the atmosphere is warmer and sexier than in Manhattan's other major supper clubs." Located at 254 West 54th Street, 54 BELOW features up to three shows nightly with cover charges ranging from $15-$95.